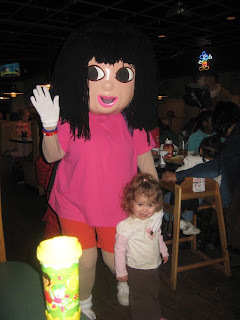 We took the kids to see Dora at a local restaurant tonight. This is the same place we saw Mickey a few months back. This Dora was a big headed crazy looking thing, but most of the children loved her anyway. 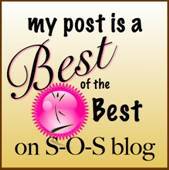 The others dissolved into pools of loud, frantic tears. You know it's always one or the other. Bella was all smiles, again, but this time she was happy to pose with Dora. And even allowed Dora to touch her! This is a huge accomplishment for my girl who freaks out when strange people touch her. Actually, she loves our friend Angela, but one day Angela tickled her tummy unexpectedly and Bella lost her marbles. So, yeah. She's sensitive. Surprisingly, even Javi posed with Dora. I'm not sure why, but he threw his hood up before taking the shot. I think he thinks it's cool. I promise you he did not eat his food that way. 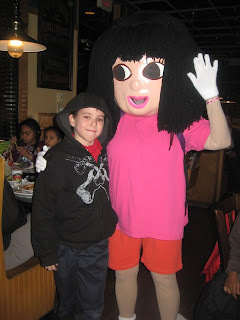 Whoa, that Dora scares me a little... don't know that I could've posed with her. Are those super-thick pantyhose she's wearing?